The 1975 Libertarian Party National Convention was held at the Statler-Hilton hotel in New York City on the last week of August. It had roughly 330 delegates from 38 states. Roger MacBride won the presidential nomination on the first ballot against Kay Haroff of Michigan and Guy Riggs of New York. After Tonie Nathan, Manny Klausner, and Jim Trotter all failed to secure the vice presidential nomination, David Bergland was literally flown in to serve as a compromise candidate. This needs to include the battle between MacBride and those who sought to present a less conservative GOP approach. Jim Trotter was the leader in the VP voting, but RLM declared he would not accept him, due to his "one issue" status (Jim was an alleged tax resister, gold smuggler and activist in other "left wing" causes). So his name was withdrawn, and that of John Vernon, an Oklahoma restaurateur, was proposed nomination. John had a strong libertarian background and had nearly been elected to the OK City Council; he was also openly gay, and Roger again raised the "one issue" claim. The convention adjourned with no VP nominee yet. A group of LP activists then stayed up all night, deciding whether or not to propose withdrawing the nomination of Roger unless he accepted the convention's choice for running mate. The next morning they yawned and downed lots of coffee, then placed Vernon's name into nomination, with Robert Nozick delivering the nomination speech, though he did not know and had never met Mr. Vernon before that morning. After the speeches were completed, Roger took the microphone to declare that he was prepared to accept anyone the convention nominated; this was followed by the nomination of David Bergland, who had been flown in from California on a red-eye plane overnight. The nomination them proceeded, and Bergland won on the first ballot. Ed Crane was re-elected as national chair without opposition. Fran Youngstein was elected as treasurer and Greg Clark as secretary, also without opposition. Regions were also selected. For example, Michigan, Ohio, Kentucky, and Indiana formed Region 5 and selected Martin Jahn of Kentucky and Bill Krebaum of Michigan to represent them. Peter McAlpine of Michigan chaired the platform committee and accepted several proposals from Murray Rothbard and Bill Evers. The focus was on increasing the emphasis on civil liberties and foreign non-interventionism. My first natcon-delegateship was in 1975, in New York. The Presidential battle was the anticlimax: Competing with the eventual nominee, Roger Lee MacBride, was a woman from Ohio named Kay Haroff, who had a fire about her and a stump speech that nailed the “pro-choice on everything” credo of libertarianism to the wall! Her “the speech” should probably have been adapted and then adopted by every LP candidate thenceforward; instead it was belittled by its critics (mostly from the right-wingers among us), and cast aside. What overwhelmed that challenge, however, was what came next. 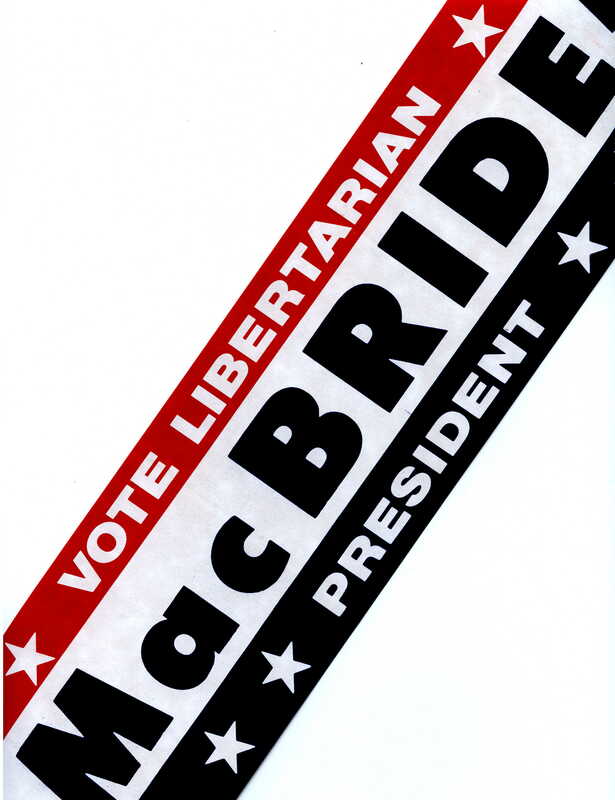 MacBride was nominated on the first ballot, despite strong challenges from both Harroff and NOTA votes, and the balloons and music, and the news coverage (from all three major networks at the time), came down with a relative roar. But what came next was a major nexus in LP history. After one round of voting for the Vice Presidential nomination, a guy names Jim Trotter was in the lead, although he lacked the majority needed to win. Trotter was a clear left-leaning radical, from his coverall jeans, work shirt and John Lennon spectacles and bushy beard, to his priority views within the libertarian spectrum. Jim was a gold smuggler, a tax resister, and a physical defender of draft and tax resisters on the West Coast, and made no bones about admitting it all. Many of us in the hall at the time thought he would be a perfect balance to the chubby Republican in the business-suit and tie who had been chosen to top the ticket. Then we discovered someone possible: John Vernon, a restaurant owner from Oklahoma City, who had already almost won a seat on the City Council there, running as an independent with libertarian issues the year before. What’s more he was in his late thirties, so passed the age barrier. The fact that he was also a gay-rights activist, one who was openly “out” even in 1975, seemed a bonus, not a drawback. At long last, as we had been hoping to do with Trotter, we could dispel the calumny that the LP was just a “right-wing front” splintered off from the GOP. But Roger objected again, using his “one issue” charge, this time complaining how it would “all be about gay rights”—despite the fact that Vernon had been far better known for his free market economics efforts during his time in OKC. Those of us still in the fight reacted by calling for a recess until Sunday, so that we could consider our options. We were still there as the sun came up. We finally adjourned, having decided (by consensus or acclamation, I forget which, but it was pretty unified) to nominate John Vernon and let the chips fall as they might. We chose three from among us to do this: Harvard philosophy Professor Robert Nozick for the nomination speech, and Bill Howell of Texas (who actually knew Vernon personally) and Richard Kenney, who was then Washington LP state-chair, but had had several years leading the Massachusetts LP before that. When the session opened, Vernon’s name was placed on the list, and Nozick stepped to the podium. His first words were quite memorable: “I rise to place in nomination, a man I had never met before last evening . . .” He then proceeded to lay out the case for challenging Roger’s presumption that he should have veto power over the convention’s preference for a running-mate, noting that the Party’s own bylaws declared the delegates’ preemptive position the choice. He sat, and was followed by Kenny and then Howell, and the die was cast. MacBride now asked to address the convention, and essentially declared he would accept anyone the convention gave him. Little did we know as we rose to applaud, another contender had just recently arrived in New York, after a hasty red-eye flight from his California home. (It would be the first of several times when David Bergland helped bail the LP out of a tricky situation.) He was now presented, in all his leisure suit and gold-chained glory, with a modified-Afro permed hairdo, and saying all the right things we had been wanting to hear, about diversity and openness. When the vote went forward this time, Bergland won with a clear majority. Although some folks considered they had maybe been jobbed out of presenting a real broad-based ticket this time, David’s soft-spoken but clear presence, and his credible “rad” credentials, smoothed over the hurts and we went forth with our LP ticket, to fumble along and get the half-percent of the vote that became almost a given for most of the next three decades.